As we step full swig into the Autumn Season, let’s explore some fab handmade objects, shall we? Enjoy a great look around these simple looking yet, (decor) change producing items! Let’s dig deeper into Fall 2013 home decor, starting with Studio Liscious, with designers Patrick Lajoie and Mara Minuzzo. As I watch the winds change the first thing noticed is the yearning for a shifted decor. 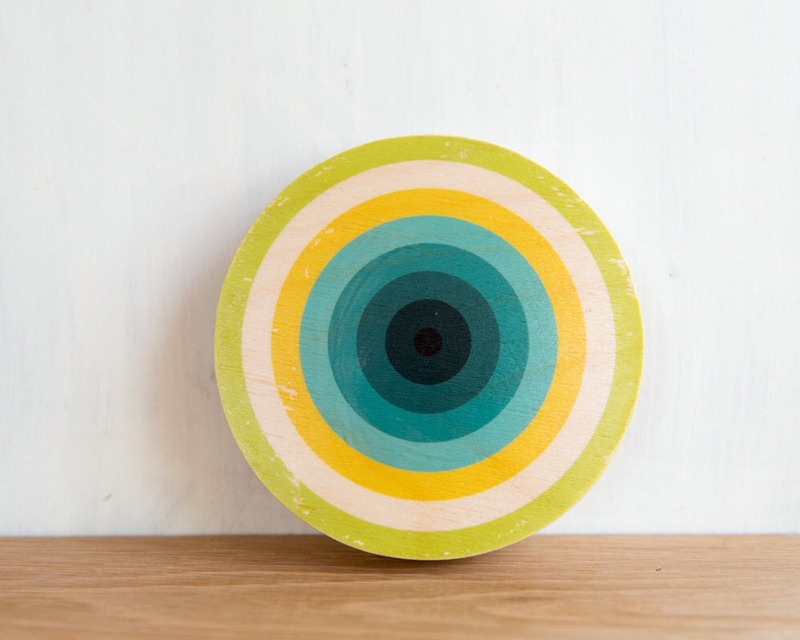 Target Circle Art Block series – small but, welcomed vibrant burst of energy in house during this time for gatherings! Every space deserves a splash or in this case a small burst of colour for the home! 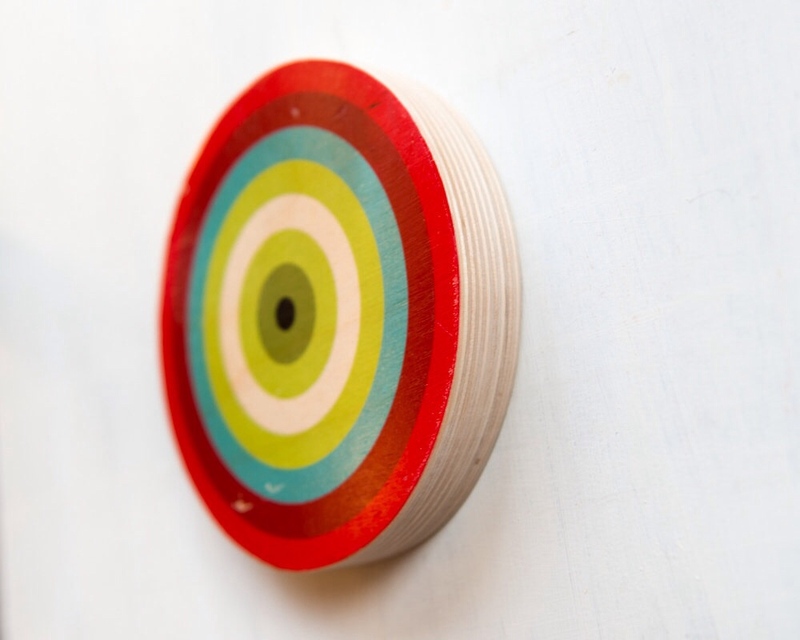 A perfect piece to admire and converse over is this again handcrafted, color adorned wooden Target Circle Art Block/Bulls Eye wall hanging. The Bulls Eye blocks are processed with a time-consuming image transfer technique. Though a slightly transparent (colour) image is revealed on each piece, this process adds handcrafted characteristics by sharing small imperfections, enhancing bits of the natural wood grains. The allowance for some weathered, vintage look, seems to precisely translate the emotional vibe felt in the Fall Season as it speaks to the many, through the desired shift in our home decor! The unique circle art blocks are available as a single piece or, as suggested sets of few or more. A hand-painted array of colour combinations and scenic views (paint by number) are offered as well. Experience the studios full Art Block series here OR Contact the couple direct, for custom made orders, combo options, and studio policies and procedures. The reason I had to post SOO many photos is because I still cannot chose a fav! I could use a set of colour and their more natural wood decor through each room in our apartment. These colors speak Autumn, just right! peruse the various colors & sets available of these punchy-colored-birds for your Autumn decor 2013 here. In closing, throughout the entire shop, you’ll be inspired to embrace the desire to change that is so immediate for some, during Autumn and the coming colder months. Each piece is handcrafted by the family of Patrick Lajioie and Mara Minuzzo, and on occasion, their teenage son Zac. After many years of renting work space, as owners of this unique Caledon-Ontario collection can finally indulge into their craft from their home studio space, enjoying times of a life coming full circle. search #StudioLiscious under explore or tags, for some happy customer & more uploaded shares! Here is our collection of Home Decor favorites and here’s another. Maybe you could let us know the best shop you’ve found for your Autumn decor? Do you feel the necessity to change seasonal objects around the home as much as we do? What colors have you chosen this year?